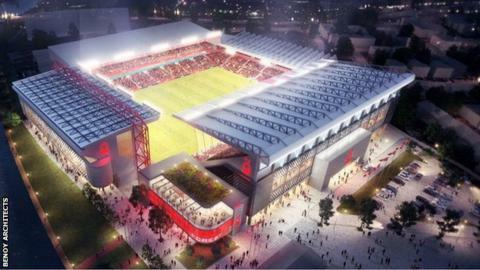 Nottingham Forest have agreed an extended lease at their City Ground home and announced plans to expand its capacity to 38,000. The proposals include knocking down the Peter Taylor Stand and building a new 10,000-seat one in its place. It comes after the club agreed a longer lease following negotiations with with Nottingham City Council. "This is our home and we will remain here forever," owner Evangelos Marinakis said in a statement. "The City Ground has iconic history and memories for our supporters and these legacies were fundamental in our decision to remain on the banks of the River Trent and not relocate to an alternative site." The new stand will include a museum and a new club shop as well as improved facilities for supporters with disabilities and more wheelchair spaces. The club says it will enter a period of consultation with fans groups before they make a formal planning application, with Forest hopeful work will begin at the end of the 2019-20 season. The ground has not undergone major development since 1994 prior to it being used as a venue during Euro 96.